Metal-working fluids contain complex mixtures of chemicals and metal workers constitute a potential risk group for the development of allergic contact dermatitis. Two metal workers developed allergic contact dermatitis on the hands and lower arms from exposure to a neat oil used in metal processing. Patch testing revealed that the relevant contact allergen was a cycloaliphatic epoxy resin, 1,2-cyclohexanedicarboxylic acid, bis(oxiranylmethyl) ester, added to the oil as a stabilizer. None of the patients had positive reactions to the bisphenol A-based epoxy resin in the standard series. These cases emphasize that well-known contact allergens may show up from unexpected sources of exposure. Further, it can be a long-lasting, laborious process to detect an occupational contact allergen and cooperation from the patient and the manufacturer of the sensitizing product is essential. In metal manufacturing processes metalworking fluids are sprayed onto the metal surfaces to reduce damage to the tools and facilitate the shaping of the metals. Metalworking fluids may comprise a multitude of components such as: emulsifiers, biocides, extreme pressure additives, corrosion inhibitors, coupling agents, stabilizers, antifoam agents, dyes, fragrances, and water. Several of the components are irritant and sensitizing, hence contact dermatitis is a frequent skin disease in metal workers exposed to metalworking fluids. Sensitization from additives in emulsifiable oils is most common, and biocides are one of the most frequent allergens in oils. Also corrosion inhibitors, coupling agents, and emulsifiers have been reported as allergens. Neat oils are used undiluted and therefore contain only few additives. Here are presented two cases of allergic contact dermatitis caused by a cycloaliphatic epoxy resin in a neat oil, an old allergen in a new environment. Two male machine workers with no history of dermatitis or atopy worked at a factory manufacturing steel backing plates and shims for disc brake pads when they developed an nonspecific, papular, erythematous, scaly, and itchy dermatitis on the hands and lower arms. The skin problems started a few days after the introduction at their workplace of a new neat oil for cooling and lubrication during the metal forming processes. The dermatitis worsened whenever they were in contact with the oil and improved during vacation periods. The patch test procedure included the European standard series (TRUE test panel 1 and 2 (AlkAbello, Hoersholm, Denmark)) supplemented with petrolatum based patch test preparations (Chemotechnique, Malmö, Sweden). Small 8-mm aluminum chambers (Finn Chamber, Epitest Oy, Helsinki, Finland) mounted on Scanpor tape (Alpharma AS, Oslo, Norway) were used, and test material was applied to the chambers immediately before testing. The undiluted neat oil was also tested on the patients under semi-occlusive conditions where the oil was applied directly to the skin and covered with Scanpor tape only. The patches were placed on normal skin on the back and removed after 2 days. Visual reading was carried out on day 2 or day 3 (D2 or D3) and on day 7 (D7). Reactions were scored according to the International Contact Dermatitis Research Group guidelines (table 1) . Subsequent testing was done with fractions containing the constituents of the oil kindly supplied by the manufacturer. The fractions contained solvents and different additives. They were tested semi-occluded in concentrations equal to the finished oil product using mineral oil as vehicle. The manufacturer requested that their name and information regarding the oil and its formulation, was not published. Based on information from the manufacturer an epoxy allergy was suspected. Therefore, a patch test series of epoxy resins, hardeners, and additives (Chemotechnique, Malmö, Sweden) (table 2) was also tested on the patients. The standard series showed no reactions except a doubtful reaction to the epoxy resin, diglycidyl ether of bisphenol A, in case-patient no 1, while the oil, tested under semi-occlusive conditions, showed a ++ reaction on D3 in both patients. These reactions were vesicular and suggested the presence of contact allergy. Subsequent testing with the six coded fractions gave a positive ++ reaction from one of the fractions in both patients. According to the manufacturer, this fraction was an additive with the trade name Ruetapox CY160/MV supplied by the company Bakelite AG, Iserlohn, Germany. We had been informed that the additive contained a chlorinated paraffin. However, an accompanying CAS number suggested that the fraction also contained a cycloaliphatic epoxy resin, and therefore a patch test series of epoxy resins and additives were included in the testing. The cycloaliphatic epoxy resin in the epoxy series gave strong positive reactions in both patients. The test results are summarized in table 2. The manufacturer confirmed that the cycloaliphatic epoxy resin was contained in the positive fraction and present in the oil. The cycloaliphatic epoxy resin was 1,2-cyclohexanedicarboxylic acid, bis(oxiranylmethyl) ester (CAS no. 5493-45-8) (fig. 1), a diglycidyl ester of hexahydrophtalic acid. One of the patients also reacted to a reactive diluent in the epoxy series, phenyl glycidyl ether (++ at D3) and diglycidyl ether of bisphenol F (+ at D7). Chemical structures of diglycidyl ether of bisphenol A and 1,2-cyclohexanedicarboxylic acid, bis(oxiranylmethyl) ester. Twenty-five consecutive eczema patients served as controls and were patch tested with the oil undiluted and semi-occluded. Also the fraction of the oil to which the patients had positive reactions was tested on 10 consecutive patients. All controls were negative. More than 90% of manufactured epoxy resins are based on the diglycidylether of bisphenol A (DGEBA) (fig. 1), while the remaining 10% non-DGEBA epoxy resins are based on the diglycidyl ethers of bisphenol F, cycloaliphatic compounds, or other more complex systems . Epoxy resins are organic chemicals that contain more than one epoxy group. 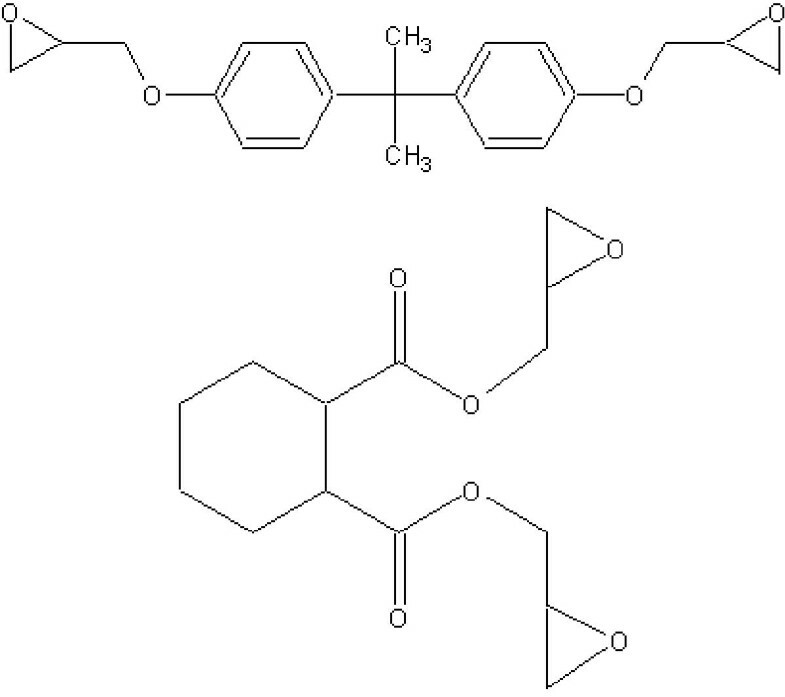 The most common epoxy compound is made from reacting bisphenol A with epichlorohydrin creating low-molecular weight polymers. The polymers are polymerized using curing agents (hardeners) as for instance polyamines or polyamides that cross-link the polymers creating a very stable network. Epoxy resins have a series of very useful properties such as excellent electrical qualities, low shrinkage, good adhesion to many metals, and resistance to moisture, thermal, and mechanical shock. They are used widely in adhesives, high performance coatings, electrical insulation, paints, inks, PVC products, etc. Most uses of epoxy resins require polymerization and hardening of the epoxy compounds, but when used as additives in oils the compounds retain their allergenic properties. According to the manufacturer, the neat oil used by our patients is a lubricating/cooling stamping oil consisting of mineral oil, chlorinated paraffins, extreme pressure, and anticorrosion additives. The cycloaliphatic epoxy resin is added to the oil to stabilize by scavenging free chloride radicals that appear due to thermal decomposition of chlorinated paraffins. The epoxy resin was present in the oil at a concentration of 0.25%. There are only few reports of sensitization from cycloaliphatic epoxy resins in oils. English reported in 1986 five cases of allergic contact dermatitis also from the cycloaliphatic epoxy resin, 1,2-cyclohexanedicarboxylic acid, bis(oxiranylmethyl) ester in a cutting oil . In 1988 Danneker published a case of allergic contact dermatitis from a cycloaliphatic epoxy resin in a microscopy immersion oil, and in 2001 Maibach presented a case of allergy to a cycloaliphatic epoxy resin in a hydraulic fluid [4, 5]. In the late 1990s an epidemic of allergic contact dermatitis from epoxy resins in Leica Microscopy immersion oil occurred. At least 24 cases have been reported in Europe and in some of these cases a cycloaliphatic epoxy resin was shown to be one of the allergens, but probably not the primary sensitizer in most cases [6–10]. Allergic contact dermatitis from a cycloaliphatic epoxy resin has also been reported from electrical insulators and pre-impregnated carbon fiber [11, 12]. At our department, 57 patients in the last 10 years have been tested with cycloaliphatic epoxy resin due to a suspicion of allergic contact dermatitis caused by epoxy resin. Of these 57 patients 5 had positive patch test reactions to cycloaliphatic epoxy resin (table 3). This includes the two cases reported here. In the remaining three cases the reactions were occupationally relevant to the patients, as they were in contact with epoxy resin at their work place. One renovated drain pipes, another did road work, and a third patient was a laboratory technician who examined microscopic preparations using Leica Immersion oil containing cycloaliphatic epoxy resin. In these 3 cases strong reactions to the DGEBA epoxy in the standard series were also seen and this compound was probably the primary sensitizer. Our two case-patients, however, showed either no reaction or a doubtful reaction to the standard DGEBA epoxy. It has been reported in several cases that the standard series often does not uncover an allergy to a non-DGEBA epoxy [13, 14]. It is important to supplement the standard patch test with the relevant epoxy resins to which the patient has been exposed. Patch test reactions to DGEBA epoxy, cycloaliphatic epoxy resin, and phenyl glycidyl ether for patients tested positive to cycloaliphatic epoxy resin in a ten year period at Department of Dermatology, Odense University Hospital, Denmark. In addition to the cycloaliphatic epoxy resin, patch testing of one of the case-patients also revealed a positive reaction to the reactive diluent, phenyl glycidyl ether. Phenyl glycidyl ether is usually added to decrease viscosity. Of the 5 patients tested allergic to cycloaliphatic epoxy resin at our department, 4 also reacted to phenyl glycidyl ether. A total of 6 patients reacted to phenyl glycidyl ether in the testing of the 57 patients mentioned above. This possibly indicates cross-reactivity between the cycloaliphatic epoxy resin and the reactive diluent . In the cases presented, dermatitis appeared a few days after the oil was introduced at the workplace and it is likely that sensitization occurred from only few exposures. Occupational sensitization to epoxy resin and other potent allergens from a single exposure has been described . In the safety data sheet of the oil no risk phrases were listed, and it was stated that sensitization from the product was not known. However, the safety data sheet of the additive itself, containing 25% cycloaliphatic epoxy resin, contained the risk phrases R36/38 (irritant to the skin and the eyes) and R43 (may cause sensitization by skin contact). The additive was used at a concentration of 1% in the oil resulting in a concentration of 0.25% of the cycloaliphatic epoxy resin. It may be that sensitization from some additives in oils occurs more frequently than indicated by the number of published cases, because the allergenic component often remains undetected. Scerri reported 12 cases of allergic contact dermatitis with positive reactions to the chlorinated paraffin component of a neat cutting oil . They did not find the sensitizer, which they believed to be a stabilizer, due to insufficient cooperation from a manufacturer. Detection of the allergenic component can be a very lengthy process that requires several visits from the patient for repeated patch testing. Cooperation from the manufacturer of the sensitizing product for acquisition of samples and information is also a necessity. However, it is important to identify the allergenic component in a case of allergic contact dermatitis. This may increase our knowledge and facilitate future investigations of dermatitis and it may also promote elimination of the allergen from the work place or from the sensitizing product preventing other cases of allergic contact dermatitis. Following the investigation of the two cases of allergic contact dermatitis presented here, the manufacturer of the neat oil substituted the cycloaliphatic resin in the formulation with an alternative compound. These cases emphasize that well-known contact allergens may show up from unexpected new sources of exposure. It can be a long-lasting, laborious process to detect unexpected occupational allergens. Investigation of the composition of allergenic working materials is required and cooperation from the patient and the manufacturer of the sensitizing product is essential. Both authors took part in the clinical examination and testing of the patients and in the writing of the manuscript. Both authors approved the final version of the manuscript.